Why are almost all Federation starships space-borne? Yes I know the Intrepid class vessels (like Voyager) are capable of atmospheric landing, but you'd think that as more and more alien races joined the Federation, races that posses atmospheric-capable starships (like the Vulcans), the Federation would have developed atmospheric-capable starships LONG ago, even before the Picard era (Enterprise D). Fast forward, and even the Enterprise E is STILL space-borne. Is hull size a factor? Or was it more just the idea that the Federation hadn't quite put that kind of priority into ship design until Intrepid Class ships? Why would they wait for atmospheric-capable ships until after transporters became standard components on starships? What was the point of Intrepid Class ships, then? I suppose I could understand using the class for planetary colonization (the ship could act as a mobile "base of operations" to get things started then take off when the colony could run independently), but that would be a very narrow purpose. Nebula class ships (the science vessels) have highly advanced sensor arrays built into them, so I would think they'd be used for planetary surveillance. What am I missing? Why doesn't the modern navy make more of its ships amphibious? @Varlock hit the nail on the head. Making a ship amphibious isn't just a matter of putting wheels on it. It also must be able to not collapse under its own weight when on land. Large ships are basically cradled by the water and risk structural damage if put on land, especially fully loaded. Their keel must be specially supported when in drydock. If you make a ship strong enough to support itself on land, that's weight it could be using for something else. An amphibious ship will necessarily be a worse seagoing vessel than a dedicated ship. Same with a starship. You don't just slap landing gear on a starship and land it. It needs to be strong enough to hold together in gravity, and be able to navigate in atmosphere. A starship spends most of its time either in free-fall (ie. orbit) when there are no forces on the hull, or in linear acceleration (ie. accelerating) where forces are applied along the length of the starship. But when landing on a planet it will be experiencing constant acceleration down (ie. gravity). Suddenly the warp nacelles and saucer are putting all sorts of new forces from new directions onto their supports and the hull. The saucer in particular, cantilevered far out over the front of the hull, will apply quite a torque. Parts of the hull would have to be strengthened just for the odd chance the ship wants to land. That extra weight and space could have been used for something else. In addition, starship hulls would have to be aerodynamic so as not to be blow about in the atmosphere too badly. Again, this would result in design compromises which would reduce its ability as a starship. And like a submarine caught on the surface, a starship landed on a planet is a sitting duck. Finally, Federation starships are built and serviced in space (at least in the Prime timeline). They don't even have to lift off from the surface of a planet on their maiden voyage. Instead, a Federation starship has transporters and shuttle-craft which are useful both in space and for transferring people and supplies to and from planets. Enterprise demonstrated the Federation has had these since almost the very beginning: orbital construction, transporters, and shuttle-craft. NX-01 Enterprise under construction... IN SPAAACE!!! There is a real world version of this: submarines. Up to WWII, "submarines" were really surface ships which could spend some time underwater. They primarily traveled on the surface using air breathing diesel engines. Their hulls were compromises between surface and underwater efficiency. Underwater they were slow, nearly blind, with very limited range. Things which were useful on the surface like guns, railings, and platforms were just drag underwater. With the advent of nuclear power came true submarines, vessels which could travel underwater quickly and almost indefinitely. A modern nuclear submarine is optimized for being underwater with a smooth, rounded hull. Features useful only on the surface such as deck guns, anti-aircraft guns, and watch platforms have been eliminated to streamline the hull for underwater travel. The result is a vessel optimized for its primary role: stay hidden underwater. Similarly, Federation vessels are optimized for their primary mission: patrol space. Out-of-universe: the producers wanted Voyager to do something that hadn't been done before in Star Trek. In-universe: the Intrepid class was a sort of "do everything" ship which incorporated a whole bunch of new ideas and technology. Some of which worked, some didn't. Their bio-neural gel packs were efficient, but always giving them trouble. While Voyager's EMH Mark 1 worked out splendidly, the rest were such a flop they were turned into mining holograms (? !mining holograms?!). Voyager landed five times in seven years. In The 37s to investigate an anomaly in the rare instance when neither transporters nor shuttles will work (so she risks the whole ship?!). In Demon to rescue an away team, again risking the whole ship and draining precious fuel. In Basics because their Kazon hijackers are nice enough to strand them on a planet rather than throw them out the airlock. In Dragon's Teeth to hide while they make repairs. And Nightingale for maintenance on the warp drive which presumably requires access to the exterior to the ship, this sort of work would normally be done at a starbase. Given Voyager rarely needed to land even in the most extreme scenario for a Federation ship, I can see why the Federation decided it wasn't worth it for future designs. 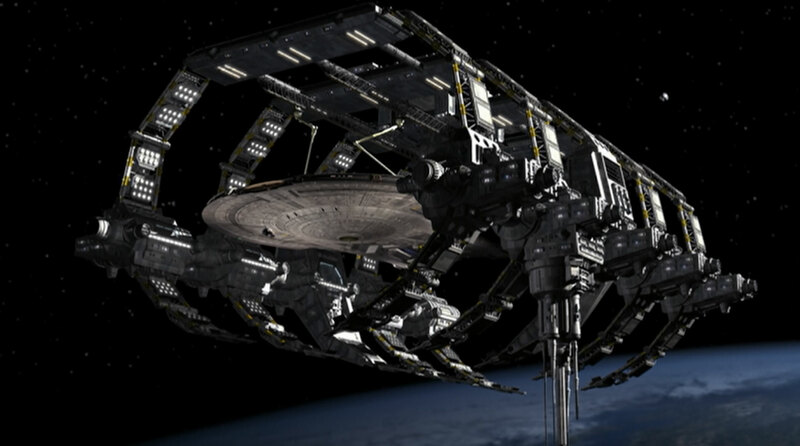 And I don't buy those spindly legs on Voyager can hold up the ship. Not the answer you're looking for? Browse other questions tagged star-trek spaceship space federation engineering or ask your own question. Why is Federation Space divided? Other starships that can undergo saucer separation? Why weren't the Sovereign-class vessels used in Dominion War battles? Why is the bridge located in a vulnerable spot on capital ships?